It came to me when I was driving my oldest daughter to school a couple weeks ago. It was cold and she was leaving on a class trip that morning. Coldest weekend so far this year and she was leaving for a class trip a few hours away. All she wanted to take to fend off the cold was a sweatshirt. She told me over and over again that’s all she’d wear. Still, I insisted she bring a coat, my ski coat, because it was the warmest one in the house. I told her she’d be thankful for it, that she’d want it. So much so, I was pretty sure it would get left behind somewhere. In a car, at the hotel, at the school. She didn’t want it. It was cold, wet, and getting colder. I could send the coat, but I couldn’t make her wear it. I couldn’t make her remember it. I couldn’t make her want it. As hard as it would be to force her to wear it even if I were physically with her, I wouldn’t be. So, I had no control over whether she would wear it or not. Just make it available and hope that she’d not only wear it, but actually bring it home. Makes me think of how we, as moms, love our kids like no other. We have a lot of “power” when it comes to where we let our kids physically go when they are young. But, we can’t control everything and we can’t make all their choices for them. So much is out of our hands. We may “control” some of their activities, but we can’t control their hearts or minds. We only have so much. The love is infinite, but the control is minute. As much as I hope she learns from my mistakes, forgives me for them, and chooses Jesus for herself, I can’t make her. Only pray and hope that she does and brings Him to her home one day. All this from how little control I had over whether she wore the coat I sent or not. Her life’s path is different from mine. God has a specific purpose in mind for her. My prayer is she follows IT. Him. And, that takes a lot of trust in her and Him from me. We can take our kids to school and put friends in front of them, but we can’t make them choose them for themselves. We can allow a phones or not, but we can’t control their friends devices. We can take them to church or not, but we can’t control their desire for God. We can make them food, but we can’t pick their food when they are away from us or make them like certain things. So, much is theirs to control. So much more than I ever knew prior. We can make them say they are sorry, but we can’t make them mean it or truly forgive. We can’t make them stay faithful or pick their spouse. We can’t control their spouses hearts or actions either. I can send a coat, but I can’t make you wear it. I can’t make you value yourself. Just hope and pray you do. I can’t put Jesus in your heart. Only pray you do. I hope, as scary as this may sound to us moms, that it also helps us relieve the coat of all the pressure. There’s a lot we can do for our kids. But, so much that we can’t and is God’s job. All I can do is the best I can at all of the above with God’s help, pray some of it rubs off, and that the bad stuff falls away by His grace alone. I heard after the trip that she not only wore the coat, but was so thankful she had it. Made me smile and strengthened my resolve that I sent it regardless of her resistance. I high fived myself in my mind. Go, Mom! I gave birth to you and carried you, but He formed you and gives you life to this day. I can wear my coat and hope you do too. But, I can’t control your heart. Only keep turning it over. After all, He’s your Savior. I’m just your mom. Our relationship was rocky. His employment had been off and on for the two years I knew him. He had been laid off for months now and it scared me. I’m well aware I could lose my job today, any of us could. But, as a single mom to two girls, steady employment is high on my list. I just couldn’t relax and get excited about the future without it. We needed help. So, he gets hired at a job fair for a well known company in the area, Praise God!! Hired on the spot. Now, to take the tests required and start working. Problem solved and prayer answered, right? ….Drug test, check. Written test, taken. Never in my mind did I consider him not passing this written test. I mean he’d been in this field for most of his working life. I just thought it was a formality. So, when I got the news he didn’t pass, my heart sunk. Now, I KNEW the problem must be him. I mean, why couldn’t he pass? I couldn’t live this way. I was less than compassionate, I was just mad and confused. I asked God if this was His sign. I know He wants what’s best for me and the girls. All I heard in my spirit was “wait”. Three hard days went by and I waited. I didn’t end the relationship, I waited and remained honest with him and God that I was highly bothered and frustrated with this situation. Everything else seemed to be coming together, except this job situation. And, I just couldn’t overlook it. On the third day of waiting and wondering, I left work early because my last patient “happened” not to show up. I didn’t have my girls that day, so I “decided” to get my nails done. When I pulled into the parking lot, I “chose” a salon I rarely went to. Still don’t know why, just decided to mix it up. Meanwhile, I’m texting with a friend about her love issues as well. She asked if I would mind talking instead of texting as she just wanted to hear my voice. I told her sure, but that I was heading in to get a pedicure so I couldn’t talk loudly as not to bother others. The staff “happened” to sit me beside a woman in the salon. I was sharing my heart with my friend about this test that he didn’t pass. I must have sounded extremely distraught. So much so, that the lady sitting next to me tapped me on the shoulder while I was talking and said “I’m so sorry to bother you, I work there and that test had an 85% failure rate, it’s the talk of the company right now.” WHAT?!? I quickly let my friend go to get more information. She went on to tell me that employees currently employed there had taken and failed this test. The problem was not him, it was the test! I would have never known, he would have never known had this encounter not happened. Not only did she ease my mind about this test and my guy, she told me to have him call her directly since her department was hiring. So excited and thankful, I shared his name and said he’d call her first thing in the morning. When she heard his name, she said she knew him! Not only did she know him, he trained her at a previous job! Needless to say, he called her the next morning and the ball got rolling. It didn’t roll smoothly, it took six weeks to get a start date. But, start he did. He just finished his first week as a direct employee at an amazing company that he may very well retire at. Not only are the benefits amazing, he is starting at twice the amount of money he would have made had he passed that ridiculous test. If my patient had shown up, if I had to go straight home, if I had gone to the salon I normally go to, if I hadn’t been talking on the phone instead of texting, if I hadn’t been sat next to her, if she hadn’t reached out to ease my mind in compassion, if she had been wearing her earbuds that day (which she told me us she usually always does when getting her nails done), if she hadn’t have tried a brand new salon to her that day…..so many ifs. You have no idea how much this day means to me. I know you’re young. 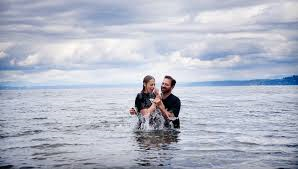 I also know that your decision to be baptized is as clear as it can possibly be at the ripe age of 10 years old. You’ve told me that today means washing away your sins. That’s true. You’ve also told me that today means that you and Jesus will get closer and closer. That is also true. But, like we’ve also discussed, we need to do our part to continue to foster that relationship. Just like you, I was baptized while attending the same school you do, in this same church. In this very same baptistery. I also believe I made the decision as clearly as I possibly could at the time. Then, life happened. I need you to know that you are the reason I got rebaptized. When I held you in my arms and stared at you in your crib, I knew I needed God more than ever in my life. How on earth would I be able to raise you to love, lean on, and honor God if I wasn’t? I knew, in that moment, that I had allowed our relationship to wither. It was you that made me a mom and it was you that brought my heart back to Jesus. For you, I am forever grateful. I know God never left me, but I went about my life not checking in with Him, not growing with Him, not seeking Him. You, Abby, changed all that for me. The love I have for you opened my heart to God’s unfathomable love for me and put me back on the path of relentless pursuit with my Jesus. I pray there are many big events I’ll get to witness in your life. Graduations, first cars, jobs, moves, boyfriends, possibly a wedding, and maybe even children of your own. I’m sure I’ll cry at each one. But, one thing I can say about today is that this relationship that you are allowing in your heart and declaring as your own can, will, and should affect them all. This is my prayer as your mom. I pray that your relationship with God trumps all others. He wants to lead you. My prayer is that you let Him. I pray that each decision you make in your life reflects the one you’re making today. I know how hard that is. And, if one blessed day we do this again, I will be right here crying tears of joy like I am today that you are choosing and walking with the Lord. As a parent now, I realize that there truly is no greater joy….. This is huge baby girl. For you, for me, and for Jesus. He is here, He loves you, and He will never leave you. I am praising God for this day! My life changer. My Abby. While I can’t personally speak of the grief associated with physically losing a child, parent, sibling or best friend yet, I can speak to the grief of divorce. As both a child of it and one of my own, I can relate to that pain. Both divorces I didn’t want. Both divorces left me at the mercy of other people’s choices. Some wonder why I grieved like I did through my own because of the way he treated me, but I still did. I grieved the loss of a dream, the loss of my will, the loss of the life I thought we would live, the loss of a man I loved whether I should have or not. I still did. I grieved the loss of his family whom I had grown to love. I grieved for my girls, I already knew the life long struggles they would encounter because of it. The loss of my marriage hit me deeper because I was determined to stay married through anything. I was willing to fight for it, and he left….without a struggle or a tear. It was devastating to my self worth, tender heart, and desire to honor my commitment of marriage. It’s been four years since my divorce and I thought I would share how I felt and some of the things that I did during my deep grief. There seems to be a lot of grief around me right now. Three deaths and a funeral this past week and my heart is heavy with loss. No one escapes grief. It comes in many forms. The emotional or physical loss of someone you love, a dream you had, or a change that alters what you had originally hoped for will need to be grieved. If this helps one person to know they aren’t alone or strange in how they feel or deal with grief, it will be worth it. My physical grief was such that I lost 20 pounds that first year. I had no appetite and excessive thirst. I couldn’t get enough water and didn’t want any food. Nothing sounded good. I ate to live for the first time in my life. Normally, I love to eat and look forward to my next meal. The food I did eat wouldn’t stay long. I was physically ill from my emotional pain. I could feel it. I had physical pain in my chest and queasiness in my stomach. I still get the same way when sad, nervous, or going through a rough time. I never missed a day of work. Work gave me purpose and routine was helpful during that time. My boss made it clear that if I needed to stay home for emotional reasons, they would understand. If I had skipped and stayed home, I felt like my sadness would have been worse. Alone, in the house we shared, alone or with the kids, didn’t help. I went to work every day and poured through the Bible between patients. I clung to Bible verses and sought God like I never had. I read and read and read. I would shut my office door sometimes and cry. When time to reset passwords would come, I would use words like “surrender”, “godisfirst”, “remember”, “remain”, and “godislove”. If I had to type a phrase over and over again, it might as well be some of these. I needed the constant reminders. I still do this. I started to walk every day on my lunch break. I already had anxious thoughts constantly racing through my mind, at least my feet could try to keep up with them rather than sitting still with my heart pounding. I felt like my heart raced whether I was moving or sitting still. Walking and fresh air helped. I still look forward to my lunch time walks. Sometimes I pray silently or out loud while I walk, sometimes I fill my headphones with music. Depends on my mood. It helped and still does. I prayed on my face first thing every morning on my bathroom rug. I cried more tears than I knew possible. I dry-heaved. I questioned. I surrendered. And, I ultimately, accepted. None of that makes what I deal with today easy. 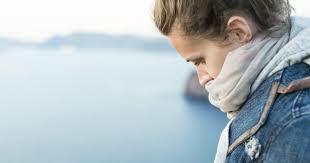 But, what I learned to do while grieving does still help me today. It also gives me HUGE compassion for others who have felt similar pain. I plugged into a women’s Bible study small group, leaned on them, and gained prayer warriors. I started to write and summoned the courage to share. I decided to write about the love I craved in hopes it would touch others like it touched me. Writing about His love helps me. The love that never walks out, demeans, betrays, or rejects. The love that never fails. I knew I needed it desperately, and still do. Grief doesn’t end, it changes. I still deal with issues because of the divorce. I’m aware that I always will. I’m also certain I will encounter more grief as this life continues. My prayer is that what I’ve learned will help me through those times. And, that I can support others through theirs. May His Love surround us. I found the following prayer in my documents folder at work today. I wrote it nine months after my divorce was final. That year was hellish. That year was a whirlwind of confusion and pain. Pain that would wake me up at night. Pain that would roll down my face at the most unexpected moments. Pain of betrayal, replacement, and loss. That year I surrendered. Rereading it, I thank God for the surrender and am warmed by my words in the midst of the painful events and changes taking place. May I continue to surrender every day of my life. Oh, how He loves…..and hears. I believe in YOU. I want to trust you with my future. You know my weaknesses and my struggles. Thank you for my strengths, they come from you. My weaknesses are where the enemy gets me. He knows my weaknesses but you know them better. Help me to know better. In my weakness, I turn to YOU. Sometimes I feel your presence and sometimes I don’t, but I pray that you strengthen my belief so that I am dependent on you even when I don’t “feel” your presence. Use me for your purpose Lord. Refine me and mold me to desire your perfect will. Don’t let me get in the way of you one more day. Please remove anyone from my life that would alter the purpose you put me on this earth to accomplish. Please add the people and opportunities in your timing that will further that purpose and ignite my love and openness to you. Show me how to serve you. Show me how to share you. Show me how to please you. Speak clearly and I will try to obey. Give me the strength and desire above all other things to obey and to listen. Your direction is for my good, I believe that too. I yearn to be transparent before you and others Lord. I know that may come with rejection and pain, but the suffering will be worth it in eternity knowing I was used, in any way, by you. As I grow and stumble every day, help me to look to You. You are why I grow and you are who I reach out to when I stumble in my humanness. I love you. Thank you for loving me. I need you. Every day I need you. She got a quarter of the way around the rink clinging to the side rails before she decided she wanted to use a trainer like the other kids. These trainers look like walkers for beginner skaters. We didn’t have them growing up, but they are really helpful in learning to balance and lean forward. She hobbled along slowly. All she could see in her periphery were smaller kids zooming past her. I just kept encouraging her, proud that she was giving it a real go this time and so thankful I could focus all my attention on her when she needed it most. I wondered what else I could do to help her, but I soon realized all I could do was watch, encourage, and be there to help her up when she fell. I couldn’t “make” her skate well. She would have to keep going and put the effort in. She would have to learn at her own pace. About half way around the rink, she lost her balance and fell HARD right on her tail bone. She looked up at me with big tears in her eyes from pain, anger, and utter embarrassment. As I helped her to her feet she told me she quit and wasn’t cut out for it. I felt so sorry for her and told her to look around at all the others falling. She said “No one’s falling but me!” I followed up with “Not true baby, look around. Watch.” So she did. Sure enough three skaters hit the ground in the few seconds I got her to look up. And, they all got back up and kept skating. Just then, one of her classmates came up to check on her. She said “My parents gave me the best advice. It’s ok if you fall, just don’t quit. Keep skating. Everyone falls. Even grown-ups!” I loved her encouragement and joy. Abby kept skating, slowly but surely. My heart swelled with love and pride as she fell again and got back up…..again. She wanted to keep skating and even hinted at the idea of having her next birthday party there. What a refreshing change! She worked up the courage to skate once around the rink without her trainer, but still felt more comfortable with it. I told her that’s what the trainer is for, to lean on. Use it. I think our praying friends are like trainers, they are there to be leaned on and they want to be. They help us balance and keep us moving forward. They help us up when we fall and look around for us when they do. They aren’t there to skate for us, they can’t. But, they are there to lean on. Everybody learns at a different pace. Some are timid, some are aggressive, some are naturals, but we are all humbled as our rear ends hit the ground. 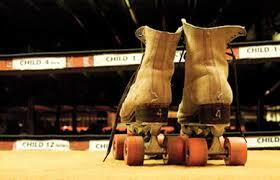 Some don’t skate anymore because of age or past injury. Some continue to skate as long as they can (that would be me). But, everyone falls. Even the best skiers and skaters still fall. It’s part of learning and it’s part of the sport. Such is life. We all get frustrated when we fall and feel embarrassed when it’s a fall in public, or worse in front of our peers. But remember, everyone falls. And, remember your trainers. Use them. That’s what God gave them to you for. There’s a big difference between giving in and giving up. Giving in is about accepting reality. Giving up is throwing in the towel on reality. When reality is too much to bare, we tend to switch over to denial or fight modes. We look for anything that helps us deny what we don’t want to face. Anything from regrets to betrayal to rejection. All extremely painful. Giving in is accepting a relationship for what it is and what it is not. Giving up would be blaming, shaming, and criticizing the other party without owning our part in the dissolution. Giving up is also assuming we must be unlovable because it didn’t work out or that it was all our fault. Giving in is accepting a diagnosis, whether God physically heals or not. His will be done. Yes, He has the power to physically heal, but the “healing of acceptance” is just as potent to the patient and those looking on. Giving up is blaming, shaming, and criticizing God for an outcome that hurts His heart even more than our own. Giving in is accepting our strengths and weaknesses as a child of God. Leaning into our strengths and gifts with humility and honor while asking and receiving His sufficient grace for our weaknesses. Giving up is bragging and flaunting what we have and can do while “hiding” our weaknesses from others and God. Giving in is watching the news today and focusing on the fact that there are still good people in this world and an All Mighty God who sees every single injustice. Giving in is leaving retribution in His capable hands, and praying for all including our enemies. Giving up is cowering in fear at the rampant evil invading our world just like the Bible has already clearly told us it will. Giving in is having our eyes wide open to what was and what is. And, accepting that. Giving up is closing our eyes tight to what we don’t want to know, see, or feel. I’ve done both. I’ve given in and I’ve given up in different situations and circumstances in my life, but I want to do better. I want to give in and accept what is without ever forgetting God’s love for me. I want to give in to what God has for me today and cherish it without ever forgetting that He’s actively aware of my concerns. I want to give in to His Spirit’s movements within me and step outside my comfort zone without ever forgetting the price He paid for me and how special I must be to Him because of it. What is on your plate today? Who is in front of you right now? What is the very next step? Just do that….in reality with prayer. 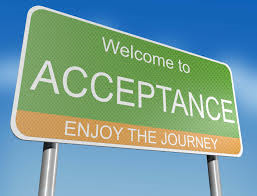 The “healing of acceptance” is a beautiful thing. I started writing this entry close to a year ago and didn’t have the words to finish it. I knew I was struggling with giving in vrs. giving up and wanted clarity on the two. Letting go vrs. holding on. I write when concepts become clear in my mind and I’m so thankful these words flowed out today. For myself and for others, I hope it helps you like it does me. Now, I have a personal reference to look back on when I question myself and the decisions that we all deal with on the daily. Giving in is not giving up. Giving in is accepting what is and what is not. Faith is being open to what’s to come. And, hope is looking forward to it! There is a specific pace and a very special grace for your personal journey. Cherish this. You are loved……no matter what.